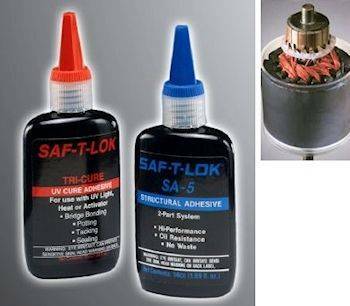 SAF-T-LOK® Structural Adhesives are designed to satisfy the demands of industry for large gap filling, high impact and shock resistance bonds. They conveniently dispense and cure with activators, UV light source or heat. This series of products begins where instant bonders leave off. SAF-T-LOK® Structural Adhesives provide high strength bonds on oily surfaces, on porous surfaces and, on surfaces with large gaps in between. They have excellent impact and shock resistance as well as higher temperature tolerance and greater chemical resistance.